Defending champion Lisandro Berry-Gaviria hasn't had to push in to many races this fall, Saturday however at the KVAC Championship held at Cony High School, the junior from Mt Ararat had to dig down to hold off a strong challenge from Gabe Coffey of Bangor. Around the two mile mark the defending KVAC Champion opened up some space that would prove to be enough for the win as Berry-Gaviria powered his way to a new course record with his winning effort of 16:33.5. The mark erased Lewiston's Osman Doorow 16:38.10 time from 2015. "The race went pretty well, my goal was to come in and break the course record." he said after the race. Lisandro said it was only his second hard effort of the season and that he hopes to be able to run in the 15:20's by the end of the season. Coffey of Bangor put in a valiant effort as he stopped the clock at 16:45, his best time on the course by over 30 seconds. His time marks the fourth best in championship history on the course at Cony. His low stick helped his Bangor team to the upset team win. Will Shaughnessy continued his strong running this fall with a third place 17:06.8 , he was followed by Wyatt Lord in 17:11. Freshman Daniel McCarthy continued his excellent first season with a 5th place finish in 17:34, next was Grahme Sokoloski with a time of 17:48. Brunswick's number two runner Tyler Patterson finished 9th (17:57.9), he was followed by Caleb Richardson of Cony 17:59.9 to round out the top 10 finishers in the "A" race. 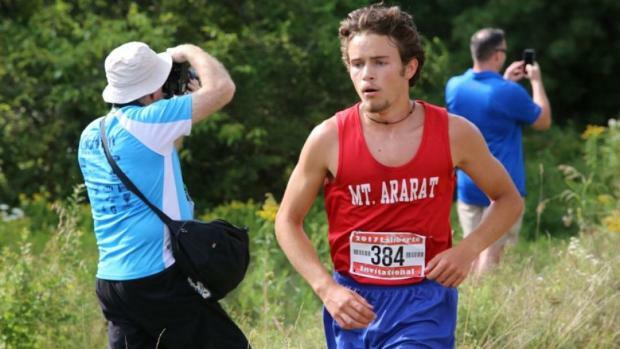 Coming into the meet it was expected to be a close team battle with MileSplit50 #2 Brunswick & MileSplit50 #4 Bangor, and they didn't disappoint. In the end Bangor pulled off a mild upset as the Rams behind three in the top 7 scored 45 points to edge Brunswick by 10 points. Hampden Academy had three in the top eight to grab third place with 69, while Mt Ararat finished fourth just 7 points back of the Broncos.